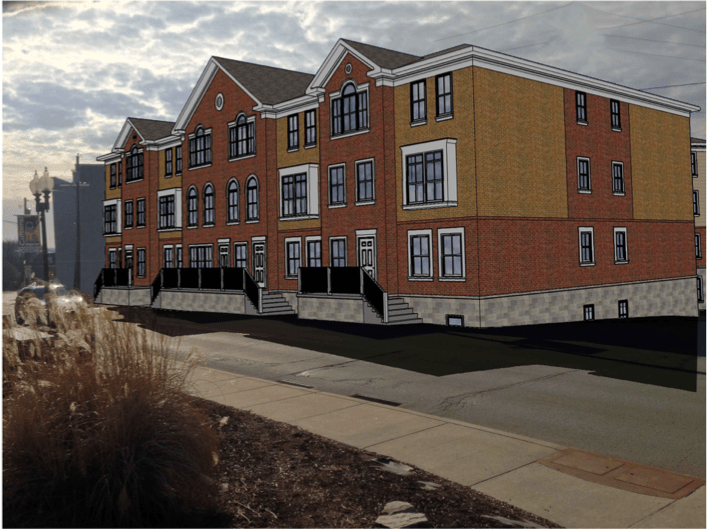 Seton Hill University (SHU) plans on offering more off-campus living space for students through a new student housing project located in downtown Greensburg on College Avenue. The new apartment building is scheduled to open for the Fall 2015 semester. It will house 58 SHU students, with preference given to juniors and seniors through the annual lottery process. The building consists of 23 two-bedroom and four three-bedroom apartments. The design for the building will be altered after receiving some criticism from board members, but the building is on schedule to be completed in August 2015. The cost per student will be $750 a month plus utilities, which are estimated at $50 a month. The cost is slightly higher that the cost of a double room in DeChantal and Farrell because of additional amenities in the apartments. Each apartment is fully furnished and has a full kitchen, a washer and a dryer. Students may choose to purchase a meal plan as well. The project would demolish five houses, four on College Avenue and one on Brown Avenue, that are vacant after being purchased by the Greensburg Community Development Corporation (GCDC) and Greensburg Property Planners LLC. The GCDC sold their newly-purchased lot to the developer for the project. A large, three-story brick building will be built on the property. SHU will lease the building from Greensburg Property Partners and manage the apartments. A 2013-2014 survey conducted by the SHU Psychology Club surveyed 919 SHU and LECOM students about their current housing and preferred living options. The survey showed that many of the students taking classes in the Performing Arts Center and Dance and Visual Arts Center want to live closer to these buildings in a university controlled apartment. After receiving this data, SHU agreed to lease 100% of the apartments within this new apartment complex to meet their students’ wants. Developer Anthony Flume said the project is on track to be completed by August. The apartments are modular and can be built mostly off-site while the property is prepared. The apartments can then be quickly assembled on the property.